The story of mom and baby who battled, and won, against Ebola. 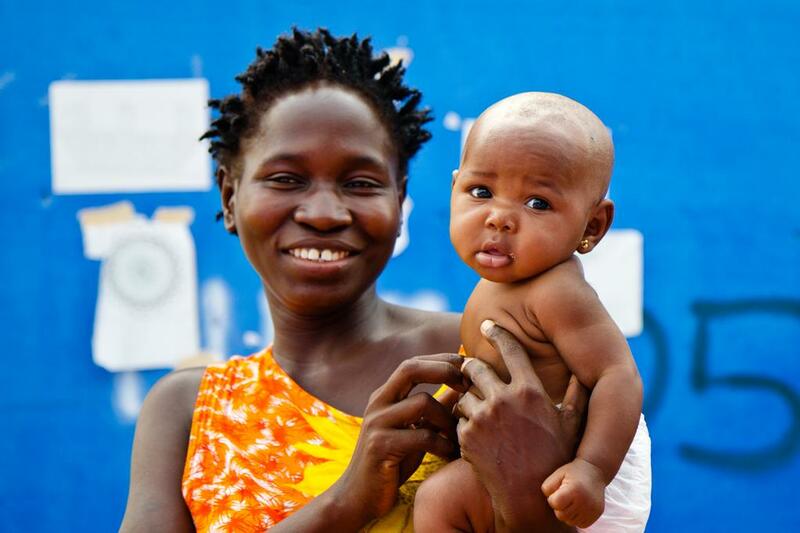 Korto was admitted to International Medical Corps’ Ebola Treatment Unit (ETU) in late November, while her four-month old daughter Josephine, who tested negative for Ebola, was cared for nearby. Although deeply saddened by being separated from her young baby, Korto maintained such positivity during her treatment. The whole medical team couldn’t help but believe she was going to make it and see her daughter again. On December 3, a delegation from the U.S. government was visiting the ETU. This happened to be the same day Korto finally received her negative Ebola test, clearing her for discharge. Korto left the patient ward giggling, laughing, and soaking in the cheers from the delegation and ETU staff, and she was finally reunited with Josephine that day. Korto noticed late that evening that Josephine had diarrhea, as well as a cough and fever. The next morning, Korto was back at the ETU, and our whole team sighed with the saddest disappointment. Seeing mother and baby back in the patient ward was difficult, but our doctors, nurses, and psychosocial support staff encouraged Korto to keep breastfeeding, which provides the best source of nutrition for an infant. For more than two weeks, Josephine’s condition fluctuated. She would become very sick one day, then a bit stronger the next day, and then very feverish the next. Because Josephine was so small, the only way to give her the additional fluids she needed was through an intravenous drip placed in a vein on her head. There were several days when we held our breath, hoping to see Josephine alive as we began each shift. Eventually she gained strength. Her eyes were no longer puffy and tired but became bright and attentive. She held her little head, now shaved for the IV, higher and higher each day. Finally on December 22, our colleague from the U.S. Navy lab, brought in to expedite Ebola testing in the area, could not hide the excitement in his voice when he relayed the news to the team. Josephine had tested negative for Ebola. Many tears of joy flowed from all of our staff and about everyone else who heard the news. Korto, of course, started dancing and clapping, smiling big with her grin we all love. And for the first time in weeks, Josephine let a small smile peek through. We have all seen so much devastation working on this outbreak in West Africa. In our ETU, we’ve lost several young patients, but bright moments like seeing Korto and Josephine together and well spur our team to continue the fight against Ebola alongside our partners and the people of Liberia. To date, International Medical Corps’ Ebola Treatment Unit in Bong County, Liberia, has discharged 74 survivors, including Korto and Josephine. International Medical Corps is operating an additional ETU in Margibi County, Liberia, and has trained over 370 health care and other workers in Liberia to date, including senior management and experts from the Liberian Ministry of Public Works, Ministry of Health and Social Welfare, and the Ministry of Defense. In addition, International Medical Corps teams are also working to fight Ebola in Sierra Leone, Guinea, and Mali.